Sliding doors are a great space saver in a small home. They allow access to rooms, closets and hallways without having to have clearance for a door to swing open. (Especially great for a bathroom!) They have become a design trend for home builders because they offer versatility, and a great look as well. 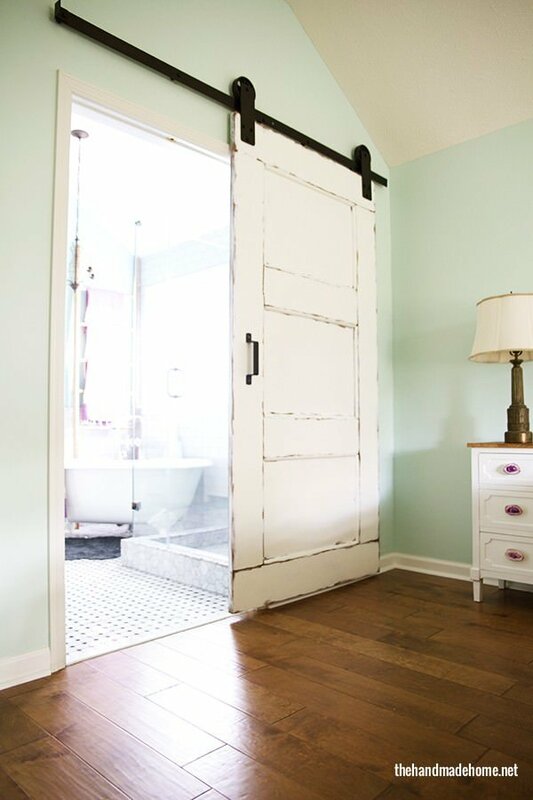 The first time we saw a cool, industrial style sliding barn door at a home show, we wondered how we could DIY it. These bloggers all found ways to get DIY sliding doors done right, and have shared their step by step tutorials. Shannon at ‘AKA Design‘ has a tutorial for not only this AMAZING DIY sliding barn door and track, but also for the grey wash finish AND the pipe handles. Oh, did I mention, they did this on a budget? So the door part of these projects may seem easy, but the tracks? 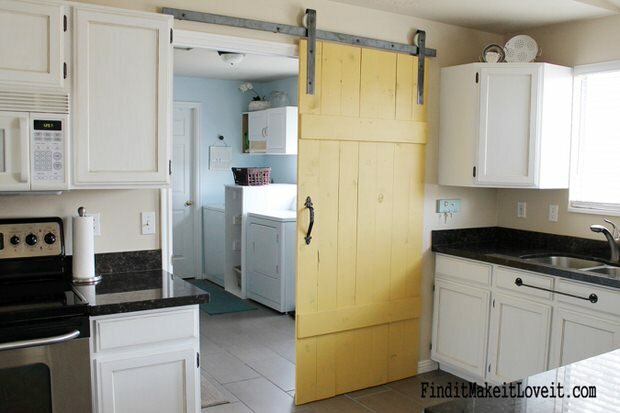 No worries, go on over to ‘Find It Make It Love It‘ and find their tutorial on these DIY sliding barn door tracks! They got everything you need at Home Depot… You can do this! 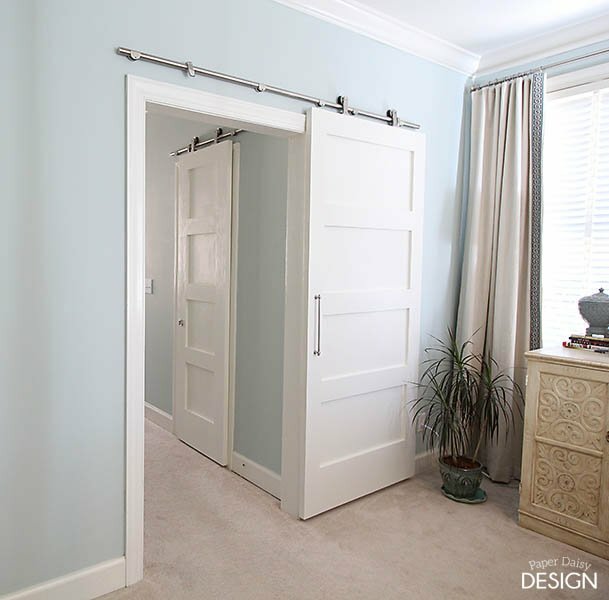 Don’t want to DIY the hardware for these sliding door projects? Go on over and visit Leslie at ‘Paper Daisy Design‘ and find out why she ordered her hardware instead of making it, and what she used. 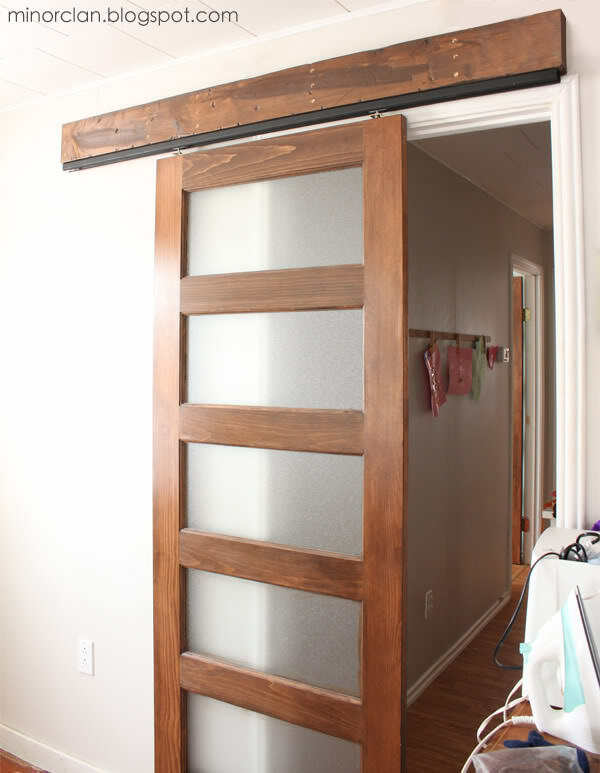 Great modern sliding barn door project! 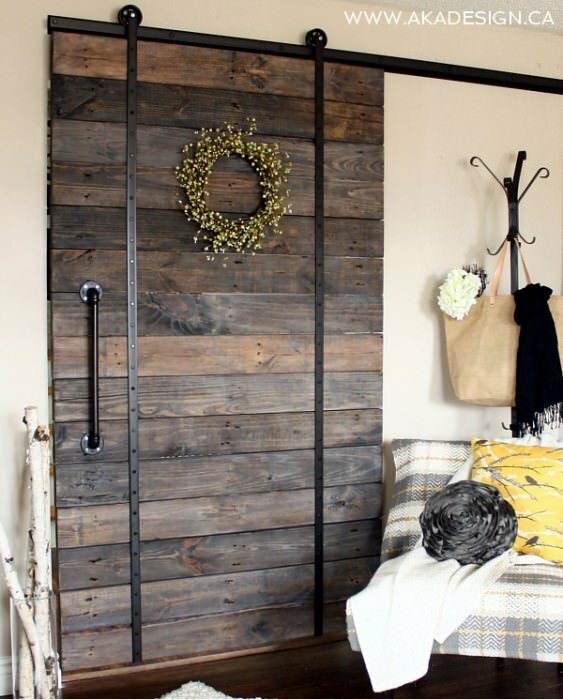 Jaime from ‘That’s My Letter‘ did this tutorial for ‘Remodelaholic‘ on her DIY sliding barn door. I love this because she has great drawings and plans on how to build the actual door, and also tips on inexpensive hardware. I love the distressed look of this project! She did this whole door, including the hardware for less than $100! Learn how to build a sliding door by ‘The Handmade Home‘! I like this tutorial because not only does it walk you through the whole process start to finish, it also shows you a photo of what the door looked like before, and then after. You know, before? When the door was just a “door”? 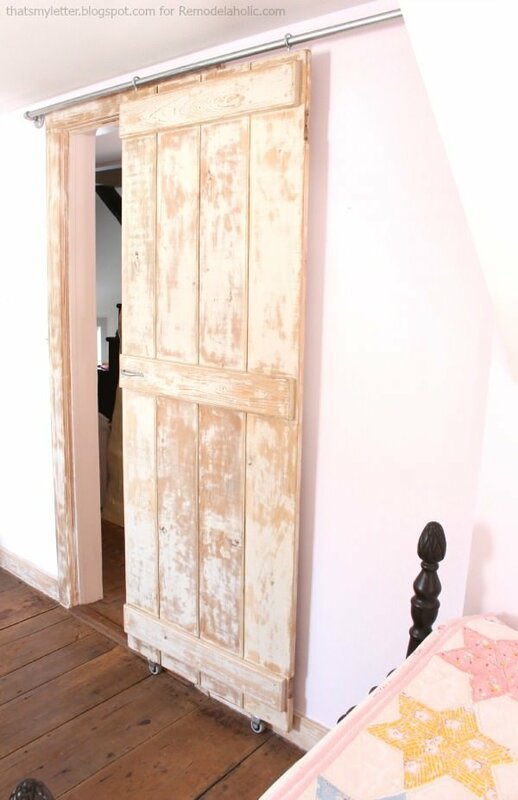 ‘The Space Between‘ blog took these old French doors someone threw away, and repurposed them into these amazing SIY sliding doors that have real character. I really love the aqua blue she painted these against the white walls. It’s a really soothing color combo! 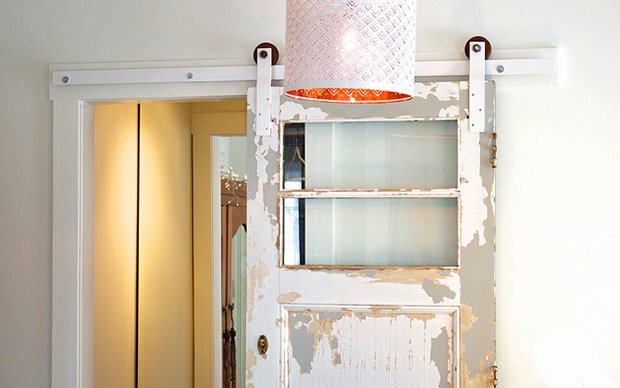 From Brier via ‘The Lettered Cottage‘, try their version of DIY sliding doors with the hardware tutorial as well! 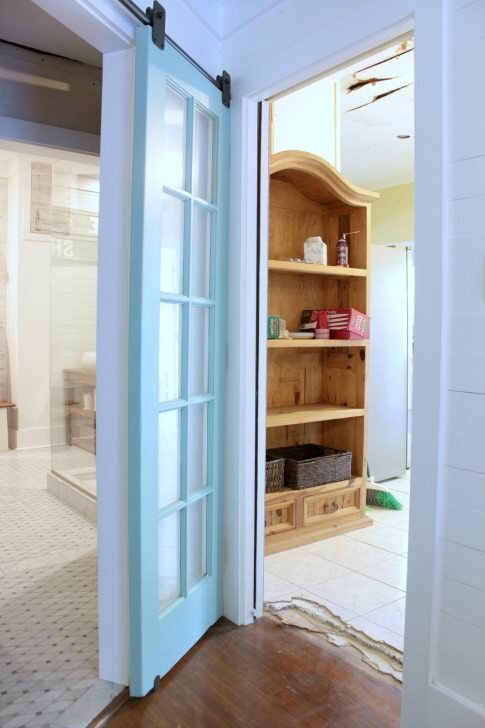 This door is a little different than the “barn door” projects we’re used to seeing, which, of course, is why we love it! Laura from ‘The Turquoise Home‘ made these simple DIY sliding doors, and has a really clear tutorial to walk you through it. The hardware system they devised from plumbing parts is super simple, and pretty ingenious. Our next project is an old door inspiration from ‘Lynne Knowlton‘. 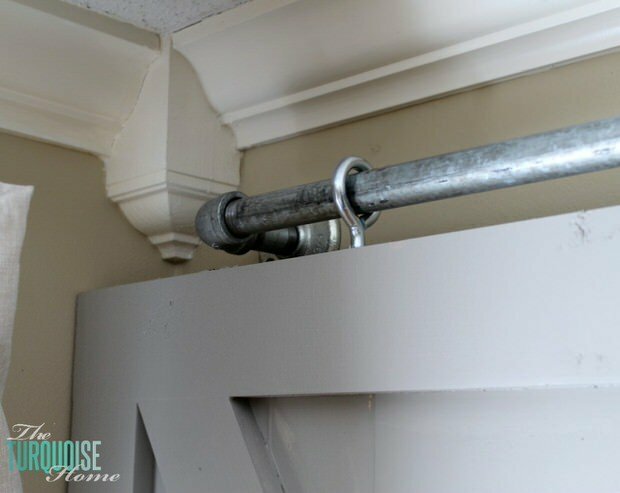 She also has a tutorial for DIY sliding door track hardware at the bottom of her post. 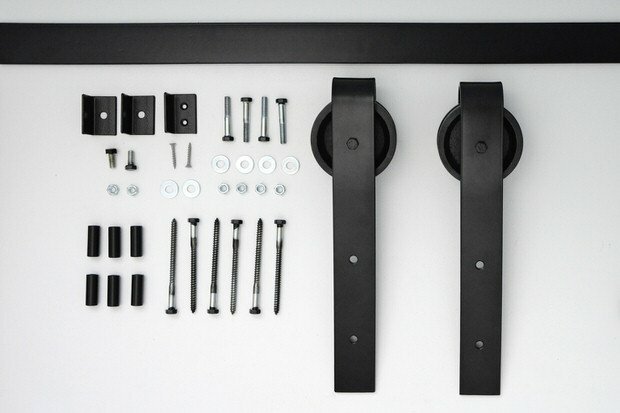 Lastly, if you just want to purchase a hardware kit and make this quick and easy, we found a resource for a great company called ‘Off The Hinges‘ that sells a complete set of barn door hardware. Gotta love easy! Are you going to be building your own DIY sliding door? They really update a room! Do you prefer a sliding barn door, or a more modern sliding door with glass? We think you will also love our posts on DIY Interior Door Makeovers and DIY Creative Room Dividers! I’ve been looking every where for barn door hardware I can make myself I like plumbing pipe and eyelet screws I made curtain rods like fashioned very affordable and last forever everyone was impressed w results. Nice Posts. Different shapes and sizes of sliding doors at cheap and affordable prices..